Acme threads are easier to manufacture than square-threaded screws. Trapezoid-shaped threads can bear heavy loads, which makes acme screws a popular choice in lead screw systems. 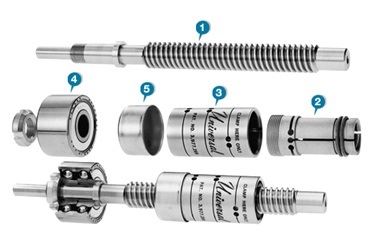 Lead screws are tools used to convert rotational motion into linear motion. When a specially designed nut is paired with an acme screw, as it moves up and down the screw, force is exerted linearly on one side of the nut, depending on its direction of motion. Lead screws are used in all kinds of machines to generate precisely controlled lateral parts movement. They can be used for delicate equipment movement or they can be used to move large plates in crushing applications. Acme screws are self-locking, which means that they prevent unwanted backdriving. Backdriving is the unintended reverse motion of a nut. There are many applications in which backdriving could be catastrophic, particularly those that involve load bearing. Acme screws eliminate this risk because of their thread shape and angle. Acme screws are useful in applications including load carrying, linear actuating and quick threading. They are also valuable components in valve stems, clamps, table lifts, jacks, screw press drives, machinery slide drives and other kinds of machinery. The main disadvantage of using acme screws compared to other screw varieties (like ballscrews) in creating linear motion is the high amount of friction between the threads and the nut. This greatly reduces efficiency, requiring a higher force input to overcome the resistance caused by friction. However, acme screws, among screw designs that involve direct thread-nut contact, are comparatively efficient, and that efficiency can be increased when split nuts are employed. The use of split nuts also compensates for wear, extending the operating life of the screw. Acme screws are available in a selection of nut materials, lubrication types, lead and thread forms, speed, length, and strength. For example, the type of load an acme screw uses could be static, dynamic or a compression load. The specifications chosen for a particular acme screw depend on the requirements of the application. Due to variable effects of friction, lubrication and cleanliness, the lifespan of acme screws cannot be predicted pre-purchase, but proper lubrication, consistent maintenance, and operation within specified limits all aid in maximizing performance of acme screws. Acme Screws Acme screws are a type of threaded rod characterized mainly by trapezoidal thread shape. Compared to other thread shapes like squares, trapezoids allow for long term, high performance use with minimal thread degradation.